The Best Commercial Terracotta Floor Cleaning Bristol. Ever wondered what those terracotta tiles you got on your floor would look like if cleaned by a specialist commercial terracotta floor cleaning Bristol company. Your commercial terracotta floor can be transformed into something you never thought possible if you use CleanAndSealUK for your terracotta floor cleaning at your business or place of work in Bristol, Bath or anywhere else in the Southwest of the UK. We can achieve amazing results with our commercial terracotta floor cleaning Bristol service, so much so that your commercial terracotta floor may never have looked as good as it will when we have finished with it. Why not put our commercial terracotta tile cleaning Bristol to the test, you can’t lose with our 100% money back guarantee. 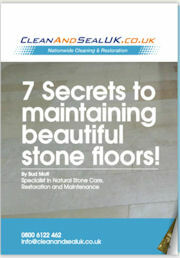 If you are looking to seal terracotta tiles and are not sure how to go about it, give CleanAndSealUK a call. We will advise you on the best method and the best products to seal terracotta floor tiles to get the desired finish you are looking for. If you’re dreading the idea of sealing terracotta for one reason or another, maybe because you have tried it before and got bad results or have heard nightmare stories about sealing terracotta tiles, then the Clean & Seal team are always happy to help. We want you to feel totally at ease with every service offered by CleanAndSealUK. So if you are looking for a professional floor care company to seal your terracotta floor tiles properly, then contact us for a quote – we always guarantee results that are second to none. If you are looking for a terracotta floor restoration company to restore your terracotta floor tiles properly, then you found the right website. All of our terracotta floor restoration guys are waiting to bring your floors back to life. We have the capability to tackle any size job, no matter how big or small, no matter how old or new your floors may be. After some hard work from the team, the floor looked brand new and brought the whole kitchen back to life. Think your floors could do with a similar transformation? Contact us today to find out more – you will be amazed with the results we can achieve.